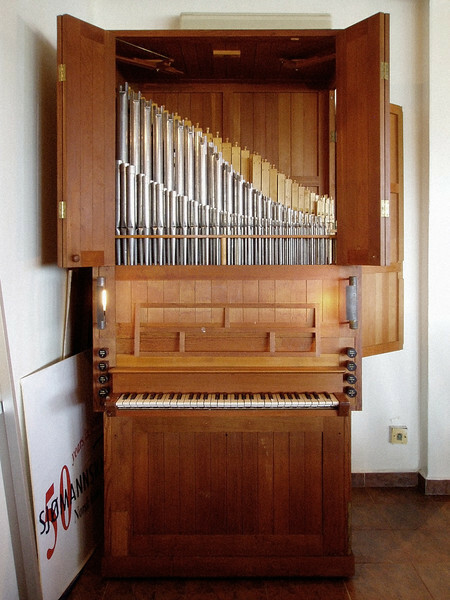 Singapore's only Danish organ, built by Starup & Søn (Copenhagen) in 1960, at the Norwegian Seamen's Mission. Photographs taken before (2005) and during (2007) restoration. Restored by Robert Navaratnam, Singapore's only organ builder. I am grateful to Alphonsus Chern, Adriel Yap, Inger Synnevaag and Robert Navaratnam for their roles in the rediscovery, documentation and preservation of this important instrument in the context of Singapore's predominantly Anglo-German organ landscape. Starup & Søn 1960. The undecorated rectangular case follows the contemporary trend of organ design for functionality in sound projection. Stops front–back: Quintatøn 2′, Principal 4′, Rørfløjte 4′ (not visible), Trægedakt 8′. The placement of the smaller, brighter registers in front is a neo-Baroque feature.